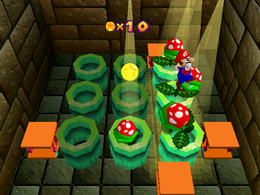 Whack-a-Plant is a single-player minigame in Mario Party. All the player has to do is jump on the Piranha Plants to gain coins as they pop out from pipes. The number of Piranha Plants increases by one every time that they come out, starting at one plant and increasing to nine, filling all the pipes. One coin is earned for each Piranha Plant that is stomped. This minigame can give the player up to 36 coins. If no coins are collected, the game ends in a "Miss!". Game Rules – "Jump on the Piranha Plants that come out of the pipes and knock them back down. Get Coins for each one you jump on." Advice – "You can reach the farthest flowers with a long jump. Hold down to do a long jump." This page was last edited on November 7, 2017, at 21:16.